courtesy of Fabulous Floors Magazine. 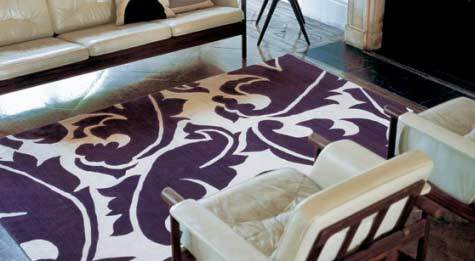 If you remember from Fabulous Floors & Fabulous Carpet Styles!, I promised you one other gem from the Summer 2008 issue of Fabulous Floors Magazine.... It's a really Fabulous Find and it has to do with color! It's a taste of things to come in the form of a Fabulous Find. 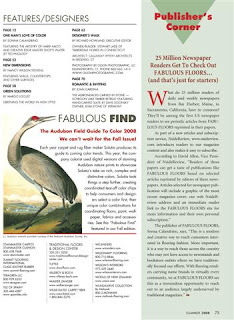 In the Fall 2008 issue of Fabulous Floors Magazine, you can count on the most inspirational and marvelous article about color... relating to the Audubon Field Guide to Color 2008. An article that the editors wrote because they were so taken with the Wear-Dated 2008 color forecast. They felt it was particularly relevant to consumers as they get started on a home redesign project, especially one that involves carpet and flooring choices. Which thrills us to pieces. "Each year carpet and rug fiber maker Solutia [i.e., our parent company] produces its guide to coming color trends. This year, the company colorist [that's Ann Hurley] used digital versions of stunning Audubon nature prints to showcase Solutia's take on rich, complex and distinctive colors. Solutia took things a step further, creating coordinated tear-off color chips to help consumers and designers select a color first, then unique color combinations for coordinating floors, paint, wall-paper, fabrics and accessories...."
In the meantime, enjoy the Summer 2008 issue of Fabulous Floors Magazine which is available on newsstands at major booksellers - like Barnes & Noble, Hastings, Books A Million - now. I'll let you know when the Fall issue comes out. Happy Labor Day weekend, too! This episode of A Foot's Perspective - as did A Foot's Perspective - Episode 10 - comes from Carpet One Floor & Home's Summer Convention in Nashville, TN. This time, the view comes from Mohawk's booth as I expose you to a carpet style, made with Wear-Dated Natural Nylon, called Hardanger by Wunda Weve. Wear-Dated Natural Nylon refers to Nylon 6,6 carpet fiber that is combined with a proprietary insert technology. The resulting fiber generates a carpet with the look and feel of wool, yet with the durability of Nylon 6,6 - the best nylon available for carpet. As we describe it in Wear-Dated Natural Nylon Makes for Stylish Carpet [which includes PowerPoint slides with micron photography], the proprietary insert technology process literally inserts a low-melt nylon fiber in between the yarn plies. During manufacturing when heat comes into play, the low-melt nylon melts, binding the yarn together. The result: tufts that cannot be untwisted, creating a carpet that has better resistance to matting [i.e., great performance], and better tip definition [i.e., that means you can create some unusually fashionable carpet styles]. Back to this episode of A Foot's Perspective. Handanger is a textured loop or an uneven loop carpet construction where the unevenness creates texture. From the photos, you may notice a fuzziness [my term and it's not just from camera focus] to the construction that I associate with the wool-ness of Wear-Dated Natural Nylon [i.e., luster, hand and appearance - if you want to get really technical]. + From Karastan: Nob Hill, Eloquence Classic, McLaren Park and Union Street. For the most recent episode from A Foot's Perspective - Episode 10. Or you can also scroll through previous blogposts with links to all previous episodes of A Foot's Perspective. Tapis de fleurs (detail) [from 8/2008] originally uploaded by Sainz. Brussels' bi-annual Flower Carpet or Tapis de Fleurs took place last weekend with an official inauguration on August 14th. That celebration included a new and original music and light show [i.e., 'un spectacle son et lumiere'] directed by Grégoire Dune - live on the 14th, and rebroadcast on the 15th, 16th, and 17th at 10:00 PM, then rebroadcast at 10:00, 10:30 and 11:00 PM. Solutia associates in our Louvain-La-Neuve location hoped to visit on behalf of The Carpetology Blog. Jacques Blomme said "I understand that this was absolutely superb but once again, almost impossible to get close unless you were ready to queue for hours. The terraces around were also totally crowded." However, Jacques forwarded me several links and resources to help bring this most recent creation to life for you. Merci, Jacques! Something to remember for visitors who stay close to the Grand' Place: you can view the tapis de fleurs from the balcony of the Town Hall, every day, from 9:00 AM to 11:00 PM, and in 2008, you could also enjoy a special exhibit of prestigious floral themed carpets: "In precious threads, rare designs and colours, these masterpieces expand one’s knowledge and satisfy the curiosity of those who come to see the famous flower carpet. They are graciously deployed here by the internationally famous Maison Sadraee." 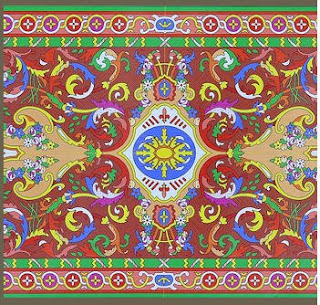 For you see, the 2008 Tapis de Fleurs motif featured floral and plant patterns. According to the official site of the Brussels' Flowercarpet, it was inspired by 18th century French patterns to create the world's largest Savonnerie carpet. Image courtesy of Brussels' Flowercarpet. The name 'Savonnerie' comes from the knotted-pile carpet factory established on the site of a former soap [i.e., savon] factory in 1627 by Pierre DuPont and Simon Lourdet, experts in carpets "in the manner of Turkey," with the royal granting of an 18 year monopoly from Louis XIII. Per Brussels' Flowercarpet, "the designs of French carpets rapidly adopted a style where floral and plant patterns, mixed with royal and, inevitably, Christian symbols." For example, did you know that the three petals of the fleur-de-lis represents the Holy Trinity? And the eight-pointed cross of the Templars symbolizes "the cosmic balance, the resurrection and the New Testament." Wikipedia's entry on Savonnerie states that "the Savonnerie style soon settled into more purely French designs, densely-massed flowers in bouquets against deep blue, black or deep brown grounds, within multiple borders" which you can see here from the two images of the carpet. According to a volunteer involved in the project, the smaller elements of the 2008 overall design made the project more difficult as described in Belgians walk on flowers. The article also details the flowers used - begonias in a myriad of colors and purple dahlias - in addition to grass, tree bark and soil. + Arnaud posted a photo of the Brussels Flower Carpet 2008 on his Xarj Blog and Podcast. 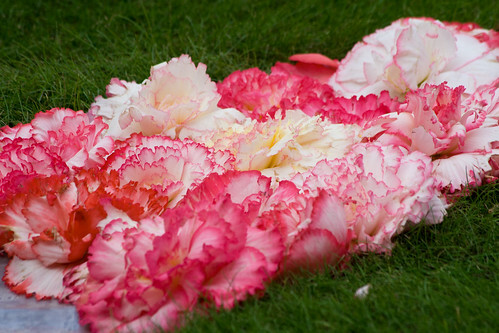 Imagine 700,000 begonias to create this ephemeral carpet masterpiece! + Brimming With Begonias, Thousands Of Flowers Carpet The Grand Place includes a magnificent slide show of nine photos of the 2008 tapis de fleurs. + YouTube features several videos on the 2008 tapis de fleurs de Bruxelles. This one [subscribers click on this link to view video of the Tapis de fleurs/Brussels Flower Carpet 2008] from abelisaurus2 gives you a taste of day and night time effects. If you weren't able to make it to Brussels, you have another opportunity to experience a flower carpet. This time in the United States and to be more precise at the Biltmore in North Carolina! Inspired by the Brussels Flower Carpet and Frederick Law Olmstead, the Biltmore unveils new flower carpet on South Terrace and it takes place, for the first time ever, from August 29th through September 14th, 2008. According to The Biltmore Estate Flower Carpet: A Living Tapestry, the Flower Carpet display is inspired by an ornate wrought iron grate inside The Biltmore House. The scale is smaller than that of the Tapis de Fleurs de Bruxelles with only 144,000 live plants used - coleus, pink and red begonias, ageratum and marigolds - for an 80 by 180 foot [i.e., 14,400 square feet] section of the South Terrace. Nonetheless, it can only delight and inspire! Sadly, the 2008 Olympics have come to a close, and on Sunday, August 24, closing ceremonies will take place in Beijing. After two weeks of amazing athleticism and thrilling competition, the world will continue as it was. The Carpetology Blog kicked off our Olympic celebration with Carpet at the Beijing Olympic Summer Games. But we couldn't let the Olympics end without recounting some of our very favorite moments - some of which involve carpet. *The gymnastics events featured carpet the most prominently. We're so proud of the American women especially! Shawn Johnson won a gold medal in the balance beam competition, and Nastia Liukin won gold in the women's All Around competition. *Michael Phelps has nothing to do with carpet, but we love him anyway. He's now the only person in the world who can claim eight gold medals from a single Olympic Games. "After 56 children, one from each of China's ethnic groups, brought the Chinese flag into the stadium, a 25m x 100m scroll unfurled to form a giant screen onto which images of China's 5,000-year history were projected. Dancers spread themselves across the bare scroll, making giant paintings as they went. Thousands of years of art, including cave paintings and one of China's most celebrated early paintings, the 12th century Song dynasty master work, A Thousand Li of Rivers and Mountains, were projected onto the scroll." *The closing ceremonies are expected to include a cast of 7,000 people - still half of the size of the opening ceremonies. Again directed by Chinese filmmaker Zhang Yimou, they're set to air Sunday night on NBC. You never know - they may include carpet! Starting today, The Carpetology Blog is reviewing a design website once a month. Sure, you can think of flooring as, well, just flooring, or you can see it as we do - an element of design intrinsically connected to the ambiance and aesthetics of a room. Take Thom Filicia's advice: design from the floor up. Since moving into my new flat, I've become obsessed with interior design. Until now, I've never had the opportunity to design a space all my own - home decor was my mom's domain as I was growing up, then I shared a dorm room and various apartments with other girls. And at that point, we had no money to spend on elements more expensive than futons and plastic end tables. (Yikes.) Now, it's time for a more grown up look for myself, and I'm discovering that the elements in my living space are a direct reflection of my personality - my home is most certainly an extension of myself. Needless to say, when I have the time, I really enjoy looking at design websites, creative places where I can find new ideas, peruse photos, and search for style and color options that will work with my taste. Today, we're starting with one of my personal favorites - Design*Sponge, known affectionately as D*S.
Founded by Brooklyn-based writer, Grace Bonney, D*S began in 2004. It's a daily blog and is often updated upwards of six times per day with delectable design bits and bites. "Design*Sponge features store and product reviews, sale and contest announcements, new designer profiles, trend forecasting and store/studio tours." It's a trip - Bonney is clever and witty, but in spite of her charm, her sense of style beats the pants off everything else. Each post has a new piece of design candy upon which to feast your eyes. Posts range from the serious to the chuckle-inducing, the local to the international. 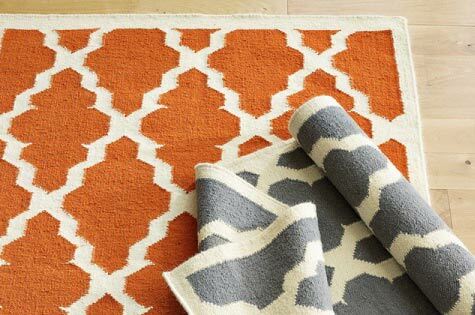 Of course, our favorite posts have to do with carpet and area rugs. 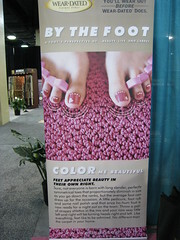 To check out some amazing treats for your tootsies, check out the Rug Roundup, Part 1 and Part 2. We also think that this particular rug is simply scrumptious. You can also check out design guides to various cities all over the world, DIY tips every Thursday, and sneak peeks at an array of designers' homes. Basically, no matter what your style or price range, Design*Sponge has a little something for you. Stay tuned... In September, we'll be introducing you to yet another fabulous design website in Design Reviews From the Floor Up. Fabulous Floors & Fabulous Carpet Styles! Cover Summer 2008 issue courtesy of Fabulous Floors Magazine. There aren't many consumer magazines that focus fully on flooring. However, there is one - Fabulous Floors - and it truly celebrates floors of all kinds in the most visual and inspiring of ways. Per the website, Fabulous Floors Magazine is "the first consumer magazine devoted solely to flooring styles as a key element in home décor." Sonna Calandrino, the publisher, exudes deep passion for the magazine, flooring and elevating the flooring and carpet experience for consumers. It comes through when you talk with her and as you read the magazine. I featured Sonna and her sister Lisbeth Calandrino, director of sales & consumer research for Fabulous Floors Magazine, in a post titled "What Consumers Really Think". You see, they both spend a great deal of time in the marketplace, observing what's happening from a consumer perspective. That helps them recognize how and which products add value and beauty to a consumer's home. In my mind, that's what makes the magazine so relevant. The most recent issue - Summer 2008 - of Fabulous Floors Magazine is no exception. It is filled with gems of all kinds. Design and color gems as well as product gems. To make my point, I'll highlight some of the fabulous carpet styles featuring Wear-Dated carpet fiber from the issue [the non-Wear-Dated ones are beautiful, too]. They are all part of an article, written by Lisbeth Calandrino, titled "In the mood... for something hopelessly romantic? How does music make you feel?" that discusses carpet style trends. Page 37 includes a room scene insert with Cambridge Shores. This is a thick, dense Karastan texture made with Wear-Dated DuraSoft carpet fiber and available in 40 colors. Page 38 shows off a room scene insert with National Legacy, a pattern loop from Karastan, also made with Wear-Dated DuraSoft carpet fiber. Look for 20 colors in that carpet style. + Fabrica's Shandur, a loop pattern available in 17 colors. The carpet catalog describes it as follows: "This unique product reflects the terrain and elevation of the Himalayas. The colors vary in intensity, creating uneven variegated streaks throughout." + Karastan's Intriga II is a sophisticated Wear-Dated DuraSoft pin-dot carpet fiber pattern in 32 colors. There's another gem in this issue, but I'll address it in a separate blogpost. 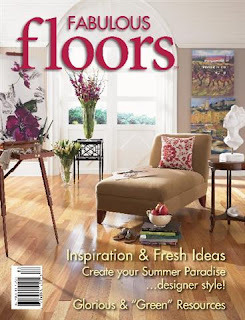 The Summer 2008 issue of Fabulous Floors Magazine is available on newsstands at major booksellers - like Barnes & Noble, Hastings, Books A Million - now. First, Hundreds Flock To See Angel In Carpet Store Window - Image Can Only Be Seen At Night. According to the article, "The image ... only shows up when the Express Mart" [across the street] "turns on its lights, which has led some people to believe the so-called miracle is just a reflection. The owner of the gas station said he started getting threats when he began leaving the light off at night because of the crowds. The owner has since agreed to turn the lights back on at night." From the image above, you can see what has people seeing angels in a carpet store. But, that's not all! That's right, there's more: Faithful See Jesus In Tree Near Carpet-Store Angel - Sightings Create Circus-Like Atmosphere. Image courtesy of KNBC Los Angeles. The latest sighting appears in a palm tree only 50 feet away from that very same carpet store window. You know, the one where the angel appears. From the article, one observer - Ramona Esquia - says "It's something of God. A sign maybe to the ones that don't know God yet, so they can know." However, a minister from a just-formed church close to the carpet store - Marcos De La Cruz - says "residents are experiencing a spiritual awakening." Or, perhaps residents are simply experiencing renewed appreciation for what carpet offers. Wouldn't you agree that carpet works in amazing ways? Support Your Local Red Carpet Reporter! 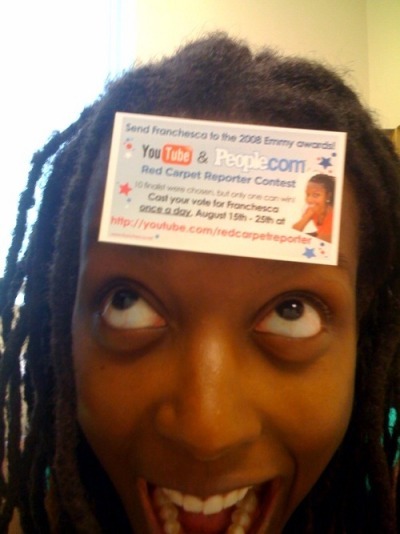 At the end of July, The Carpetology Blog was quite taken with a fetching little contest called Be a Red Carpet Reporter. 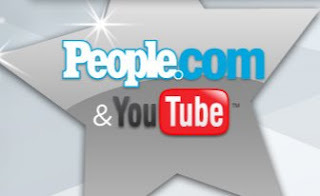 Sponsored by YouTube and People.com, it gave average Joes and Janes the opportunity to schmooze and mingle with Hollywood celebrities for one night simply by submitting a two-minute interview video to the site. None of us here actually submitted anything, but, secretly, we all wished they would automatically consider us because of our charm, wit and affinity for carpet of all colors, including red. Today, all of our dreams came true. Sort of. Chescaleigh left us a little gem of a comment, alerting us to the fact that A) the top 10 contest submissions were posted, and B) she is one of them! It's the next best thing to being finalists ourselves. Carpetology is officially living vicariously through Chescaleigh who - with a little more digging - we discovered that we like a lot! *Her name is Francesca, and she's a self-described graphic designer, singer and comedian who works by day for the Miami Beach Chamber of Commerce. *She has a great sense of style and (here's my favorite part) shops at Target! *She gives a delightful interview - check out her video on YouTube here: http://www.youtube.com/redcarpetreporter. Don't you just want to be her friend? If you find yourself with a spare moment anytime between now and August 25, send Chescaleigh a note of encouragement and, more importantly, vote for her in the contest! If she wins, we all win. Please, vote for Chescaleigh. A red-carpet battle royale, Francesca is a finalist. Hurray! No surprise, but I'm endlessly encouraged when I encounter examples of how carpet adds a certain "je ne sais quoi" to an environment. In a camping environment, carpet adds insulation, protection from the elements, but it also considerably adds to that homey feel that lets you sleep deeply at night. I don't know about you, but I feel a bit more vulnerable when I'm out there in the elements. Sleep can be elusive. Poor sleep means crankiness the next day... Not a good scenario. So, for the rugged camper looking for a practical solution to an otherwise miserable living/sleeping situation, I urge that you read OUTDOORSmagic Gear news. In particular, read about the Vango carpet in Carpet for your tent. Nylon [especially Nylon 6,6] makes for the best possible carpet. Vango obviously understands carpet as they explain that "the carpets are made from sumptuous woven Nylon supplemented with a luxurious foam middle layer and a waterproof, non-slip PVC base." Now, in the workplace, carpet adds cachet, improves productivity [see A Foot's Perspective - Episode 4 for more information about carpet and productivity], creates comfort underfoot and expresses a distinct sense of style. So, why not accentuate and take advantage of all of those benefits? Image originally uploaded by Jared D. Nielsen. This wonderful image from Jared D. Nielsen's post titled "Extreme Cubicle Makeover: Red Mahogany Luxury Paneled Cubicle with Dark Cherry Hardwood Floors" makes my case. Don't you agree that high design such as this in the workplace, particularly in a cubicle, can only elevate, enhance and improve? I do have one suggestion. A larger rug. For that matter, what about wall-t0-wall carpet for this cubicle? It would add to the richness of the experience, help absorb unwanted noise from neighboring cubicle mates and generally enhance the work environment. Here's to adding that extra special touch to your every activity - from camping to working - with carpet. You won't regret it! Episode 10 of A Foot's Perspective celebrates one of my very favorite carpet styles - Millennium Nouveau by Wunda Weve - in the most glorious color possible: Gerber Daisy. It just so happens that I had the luxury of having Millennium Nouveau underfoot the week of July 21, 2008 when I spent the entire week in Nashville, TN. The reason? Carpet One Floor & Home and Flooring America/Flooring Canada's summer conventions. First, a bit of carpet style information. Millennium Nouveau is considered a textured loop construction. It's a loop [although not totally a level loop]. It consists entirely of loops, but the unevenness of the loops creates a textured look and feel. Gerber Daisy may not be the color you decide to surround yourself with, however it is a color with character. Millennium Nouveau comes in a range of 60 colors -- all equally vibrant. For someone who loves color as much as I do, the color line is refreshingly intense. And, yes, it is made with Wear-Dated carpet fiber. Possibly the most fun aspect of having spent several days with Millennium Nouveau in Gerber Daisy pink underfoot was being so perfectly coordinated with the Wear-Dated By The Foot marketing campaign [if you haven't already, please read Marianne's post about "Feet Appreciate Beauty"]! It made for some very fun conversations with convention-goers, and terrific foot photo opportunities [do check out my Carpet One Flickr set]. In the meantime, I proudly share with you Episode 10 of A Foot's Perspective from the Wear-Dated booth at the Gaylord Opryland Convention Center in Nashville, TN. For the most recent episode from NeoCon, click A Foot's Perspective - Episode 9. Or you can also scroll through previous blogposts with links to all previous episodes of A Foot's Perspective. Please, before you buy carpet, do download the Wear-Dated Carpet Fiber Show Me Sheet! Consumers, designers and retailers have told us that it's one of the most valuable documents they've encountered for organizing carpet buying thoughts. What I like most about the Wear-Dated Carpet Fiber Show Me Sheet is its simplicity and thoroughness. Its purpose is to organize your thoughts around what to look for in carpet and carpet styles to best suit your lifestyle and design preferences - before you walk into a store. So that when you do enter a store, you have better control over the conversation with your salesperson and the choices available. By the way, if you're starting fresh, you might bring in a pattern or piece of artwork to use as the basis for a color palette to work from [see Color and The Retail Experience]. On the Wear-Dated website, you can find Wear-Dated Carpet Fiber Show Me Sheet in the Newsroom document library; in Plan & Design in the Carpet Style & Lifestyle section and in the results page when you Find a Retailer to Buy Carpet from. I hope you download the Show Me Sheet before you buy carpet. And, do let me know how it works for you. 2008 Beijing Olympic logo downloaded from PRWeb. It's here! It's here! The 2008 Beijing Summer Olympics! For four years, the world has waited in eager anticipation. Finally, the day has arrived. Friday, August 8, 2008, kicks off the 29th summer Olympic Games in Beijing, China. There has been quite a bit of controversy around these games thus far, but in spite of some interesting press, the show will go on. People of all countries, nationalities, races and backgrounds will huddle around their television sets to watch the astounding grace, strength, athleticism and talent that Olympic participants possess. And then, of course, there's the carpet. Oh yes, even at the Olympic games, we're thrilled to see the carpet! At the opening ceremonies, you'll apparently get a glimpse of a very dramatic carpet. According to television footage taken of a dress rehearsal, at one point, a huge, carpet-like scroll unrolls; it's apparently a massive piece of artwork. The Times in London describes it as a "giant traditional scroll painting of misty mountains on which gymnasts cavorted." What does this mean exactly? We don't really know, but we're excited to find out! Apparently, Korean television news station SBS recorded the rehearsal and caused quite a stir by broadcasting the resulting footage. The opening ceremony's secrets are kept under lock and key, complete with rumors of confidentiality agreements for participants, three rings of security, and jail time for those who don't comply. What we do know for sure, however, that Chinese filmaker Zhang Yimou (Crouching Tiger, Hidden Dragon) took three years to develop a lavish 50-minute show based on the history of China. The show will take place within the 3.5 hour opening ceremonies and will include a cast of 10,000. Be prepared to be amazed! Kerri Strug at the 1996 Olympics. During the gymnastics, there will most certainly be carpet. I have to say, the gymnastics are my favorite and always have been. I wanted to be Kerri Strug when she landed her vault perfectly to win her team the gold medal in Atlanta in 1996. (In fact, I still get goose bumps about it.) This year, the United States women's team has strong hopes for the gold, according to ESPN. A very literal red carpet has decorated the path of the Olympic torch bearers. 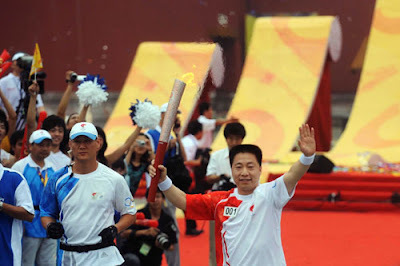 The torch relay began on July 2 and will end on August 6 after having passed through numerous Chinese cities and communities. Below, Yang Liwei, China's first astronaut, runs with the torch as the first torchbearer at the Meridian Gate of the Forbidden City in Beijing, China, Aug. 6, 2008. The Olympic torch relay began its final leg in Beijing from the landmark Forbidden City Wednesday morning. And, interestingly, there is another type of carpet at the Olympics this year: the figurative red carpet. According to a McClatchy wire story by Linda Robertson: "China has rolled out the red carpet for the Olympics, but behind the polite smiles, the government is using the Games as a showcase for legitimacy, respect and power." An interesting take on the carpet concept. The article is a fascinating one, so if you're interested in learning more about China, then and now, I'd recommend it. So there you have it. Carpet in all nooks and crannies of the 2008 Olympic Games. Don't forget to tune in! About Us: What Is Wear-Dated? I recently realized something. That I haven't really explained what Wear-Dated is and what it represents. I realized it thanks to a 'Get To The Point' article from MarketingProfs titled "Blogging for Dollars." Not that any of us at The Carpetology Blog are actually blogging for dollars. It goes way beyond that. We blog to showcase the better, softer, more fashionable and inspiring side of carpet. We blog to share information about what matters in carpet -- when you're exploring what's available, have decided to purchase a carpet style and then want to care for it. You see, I wish the whole carpet buying process were at lot more fun and fashionable. I wish carpet were showcased in as exciting an environment and context as Brighton accessories or Hermes scarves or Zappos shoes! That's why I blog here at The Carpetology Blog. To bring you up-close-and-personal to the latest carpet styles, to offer you resources for more information - including from the Wear-Dated website - and to make sense out of purchasing and caring for carpet. I *hope* that when you explore carpet choices in retail stores that you'll want to see what's available with Wear-Dated carpet fiber. But, I also know that first and foremost you need to find the perfect carpet color and style before deciding whether to purchase branded or unbranded carpet fiber. Getting back to 'Blogging for Dollars.' It's based on a post by Michael Martine from Remarkablogger titled "The 5 Elements Every Business Blog Must Have" where he says that a business blog must include "clear basic business info, highly visible and functional contact page, highly visible services/products pages, a killer about page, highly visible RSS and email subscription area." In other words, the basics must be covered. So let me cover the basics. Wear-Dated is Solutia's brand and warranty to the consumer on carpet made with our fiber. Solutia makes nylon 6,6 carpet fiber, the durable carpet fiber. Solutia is based out of St. Louis, MO. Wear-Dated is based out of Kennesaw, GA, close to Dalton, GA, the carpet capital of the world. We don't sell anything directly to consumers. The fiber we make goes to carpet mills [like Mohawk, Karastan, Fabrica, Gulistan, Royalty and Tuftex] to be transformed into carpet that retailers purchase to then sell to consumers. We test the carpet made with our fiber. It if meets our Wear-Dated construction and performance requirements [e.g., wear & soil resistance, appearance retention, and stain resistance, color & lightfastness, tuft bind, and static control] then it carries the Wear-Dated carpet fiber brand label and warranty to the consumer. + In the Wear-Dated website newsroom, we list media contacts, too. Although we do showcase products, offer installation advice and care & maintenance recommendations in The Carpetology Blog, for an in-depth view of carpet styles made with Wear-Dated carpet fiber, I strongly encourage you to visit the Wear-Dated website Carpet Catalog, the Sales Assistant or the Retailer Locator. We also detail Warranty & Care information on the website, including filing a claim, a stain removal guide and general carpet care tips. This blogpost officially addresses About Us. The Wear-Dated website also includes in the Newsroom a section titled About Wear-Dated with information explaining what is Wear-Dated, who are the People of Wear-Dated, corporate social responsibility, a Wear-Dated timeline and what's new at Wear-Dated. If you check out the left sidebar of The Carpetology Blog, you'll see two subscription options: via RSS and email. We' ve also added similar subscription options for the Wear-Dated website Newsroom for any new press releases or news updates. Please let me know if I've missed something. I'm hopeful that this tells you more About Us and gives you a better sense for What is Wear-Dated. By the way, Shannon Bilby at FloorTalk! interviewed me about Wear-Dated [Thanks, Shannon!] so you can read more. NeoCon's World Trade Fair brings together exhibitors [in 1,200 showrooms and exhibits], designers, manufacturers, buyers and specifiers from around the world. It features every product for every commercial interior type, including floor covering -- the second largest category [much of this from FCW1.blip.tv's NeoCon 1 episode]. No surprise, then, that it should capture so much inspiration, not just for the floor as you saw in A Foot's Perspective - Episode 9, but for all aspects of an interior. As Ann Hurley explains, "this year at NeoCon the new trend story was all about creating 'contrasts'-- through texture, color variation or -the newest- luster!" She illustrated the contrast story in A Foot's Perspective - Episode 9 using examples from the Ultron carpet fiber showroom floor. + Texture contrasts can be created through a shadowing effect of tufting high loops and then tip shearing. + Color contrasts can be very bold or subtle depending on the coloration. Bold contrasts are often created by planting dark colored yarns such as chocolate or graphite among lighter colored yarns. The use of bold multicolored yarns is often seen to create contrasts. More subtle color contrasts are created through the use of tonal yarns. The use of light to medium or medium to dark colors in the same family produce a high end sophisticated coloration. + Luster contrasts come from mixing high luster yarns with duller yarns creating a new upscale visual... Also the variation of twist levels in these more lustrous yarns contrasts very nicely with lower twist of natural lusters. In addition to the examples on the showroom floor, Ann used the walls. More specifically, the color and texture collage or "assemblage" of new color and texture trends [see photos above] allowed her to visually discuss new trends. Which she did with Kim Gavin, from Floor Covering Weekly, who captured it all in a video. In the video, Ann discusses color. + Chocolate browns remain strong. + Lots of red - chili pepper and cayenne - still yellow- and now almost brown-influenced. + Greys: very metallic, alternating warm and cool tones. + Beige in warm/cool combinations. + Blues: also yellow-influenced, but notice the new navys, combined with yellow-greens. "Although primarily about texture choices, neutrals are holding very strong with a larger representation of the grey family than in previous seasons, and several new bright colorful products in the red and orange families," she says. Watch for yourselves. Subscribers, please click on the FCW1.blip.tv link for NeoCon #2 [Note: you may need to physically re-click on NeoCon #2 to view the program]. What trends have you noticed? How would you see them used in the spaces your work in? How might you translate them for the spaces you live in? That's right folks; after serious research and thoughtful deliberation, it's time to shop. Put on your tennis shoes, bring a snack, and make sure the kids have a baby sitter, because this could take a while. Before you hit the road, hit up Google for the carpet retail stores nearest you. You can also check out the newly redesigned Wear-Dated Retailer Locator for those retail stores that sell carpet made with Wear-Dated carpet fiber. And you can also visit Costco, Home Depot, Expo Design Center and Sears' Great Indoors for carpets made with Wear-Dated fiber as well. In fact, you may want to start there - they're a little less intimidating, they have a smaller selection, and you can browse without feeling overwhelmed. In fact, this is where I began. I'll be carpet shopping right along with you in order to more accurately describe the experience. 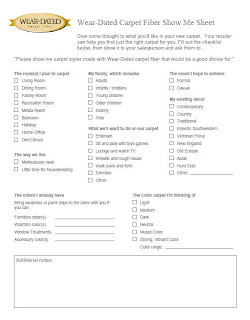 Before I started out, I downloaded Wear-Dated's Show Me Sheet so I could focus my thoughts - I'm looking for carpet for my living/dining room, I have little time to do housekeeping, I'm the only one living in my home but plan on entertaining, and my style is casual (yet sophisticated, of course). First, I searched for the Home Depot closest to my office, and on my way home one night, I stopped in to get a better idea of their carpet selection. I walked into my neighborhood Home Depot and navigated my way (via excellent signage) to the carpet/flooring area. The carpet section was actually quite small. Personally, I was glad of this so that I could come to terms with carpet merchandising and understand my options before making decisions. A small office space housed desks and two Home Depot experts, evidently working with carpet-buying customers. Carpet squares were arranged by type first, then by brand. I was able to look at and touch my options. Signs offered prices per square foot of carpet as well as prices per square foot of carpet padding. I examined each of the carpet squares, first looking at pricing, then looking at the carpet label on the back of each square. [Explore the mystery of carpet labels at the bottom of this Wear-Dated website page.] All in all, it was a painless experience. And it prepared me to tackle my next endeavor - the flooring retail store. This week, I did an online search for carpet retail stores near me and slipped out of the office mid-afternoon to explore the first store . This particular store - JJS Flooring & Decorating - is located in south St. Louis. It's your basic flooring retailer, friendly enough, but warehouse-like, traditional and, well... manly. By manly I mean that there were no amenities, no comforts - it was definitely run by and geared toward men. I got the impression that they serve a lot of contractors (a male-dominated profession), but since it is a retail store and women make up the majority of home retail consumers, I had hoped for a bit more. I walked in and was promptly greeted by a sales associate in jeans and a ball cap who showed me to the back half of the store - the carpet section. He lead me directly to the plush carpets, then left me to browse. The carpet displays were set up around the room, and huge rolls of carpet stood sentinel in the back (warehouse-style), samples of flooring surrounding me. John, the sales associate, eventually returned. He was a very pleasant, straight-forward sort of man. I asked about carpet durability, and he talked to me at length about brands, materials and types of carpet. I was impressed by his knowledge and the time that he took with me. He seemed passionate about flooring and honest about the products. This is the kind of salesperson you want to find, regardless of the retail store you visit. Kudos to John at JJS Flooring & Decorating for his passion and experience. I'd also like to mention the store's exceptional website, http://www.jjsflooring.com/. Maybe the store itself isn't as female-friendly as I'd like it to be, but the website is well-constructed, attractive, and easy to navigate. It has an online showroom, shopping and interior design tips, and even news about design, products and decorating. Very nice. My next retail experience took place a few weeks later. I decided that I would visit Becky's Carpet & Tile Supercenter, a chain of stores well-known in the St. Louis region because of Becky's flying carpet commercials that have been on TV since I started watching Sesame Street. [They portray Becky on a carpet, soaring above the St. Louis arch, discussing her latest flooring bargains. Awesomely bad.] So I drove north to their University City location to do a little browsing. Image originally uploaded by William C. Hutten. The store itself was pretty sparse. It contained massive rolls of carpet, boxes of hardwood flooring, and two salespeople. One of these, a small woman, assisted me. She was nice, but far less chatty than John had been. She too seemed to really know and understand flooring, and she succinctly answered my questions about carpet, then left me to browse. I didn't learn any more than I had at JJS, so I decided that I needed to move on. First, make sure you ask questions. Chances are, the salesperson or store owner has been in the business for many years; he or she knows and understands flooring and even has a passion for it. Second, make sure you find a store you're comfortable with, one in which you feel confidant doing business. Third, ask around. Talk to your friends and your friends' friends about which retail stores they've had good experiences with. Word of mouth will launch my next round of retail visits. Join me next week when I visit Advance Carpet One, Midwest Floor and Brewers Flooring, all recommended to me by someone who truly knows carpet.